If Lupe Dávila and Javier Utierre can survive each other’s company, together they can solve a series of grisly murders sweeping though Puerto Rico. But the clues lead them out of the real world and into the realm of myths and legends. And if they want to catch the killer, they'll have to step into the shadows to see what's lurking there—murderer, or monster? Ann Dávila Cardinal is a novelist and Director of Student Recruitment for Vermont College of Fine Arts (VCFA). She has a B.A. in Latino Studies from Norwich University, an M.A. in sociology from UI&U, and an MFA in Writing from VCFA. Every January she runs VCFA’s Writing residency in Puerto Rico. Cardinal co-wrote Sister Chicas (2006), a contemporary YA novel. 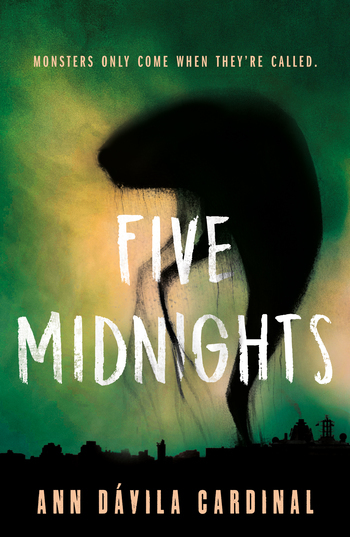 Five Midnights is her first solo novel.